For anyone who’s afraid to make a pie, meet Scottsdale resident Kelly Sallaway. She baked her pie last week in her 1967 Sunray electric range with no features except an on and off dial. But as Kelly likes to say, “it’s not the wand, it’s the wizard,” and she won First Place and Grand Prize for her double crusted peach pie. Her entry, with a secret “spirited” ingredient in the crust, beat out dozens of cream, nut, and fruit pies in the Pie It Forward contest sponsored by Palo Verde Outreach benefiting veterans via Fischer House and Honor Flight. An Arizona native, Kelly’s baking inspiration comes in part from her grandfather, who settled in Arizona in the 1930’s as a pastry chef, and who cooked for movie stars and presidents in the Hollywood Dude Ranch heyday at the San Marcos in Chandler. Kelly has graciously given up her prize-winning recipe so that we can pie it forward ourselves! It is absolutely peachy and here it is, her own words! Put dry ingredients in a food processor or bowl. Cut in the shortening and butter (using only a few pulses). Add egg, vanilla, and vodka. Pulse once, then add as much of the water as you need to make the dough start forming into beads. Make sure to stop before it looks doughy - it should be crumbly. Wrap it in plastic wrap and place in the freezer or refrigerator while you make the filling. Peel and slice peaches. Place 1 cup of the sliced peaches into a Dutch oven. Add the sugars and butter. Cook until soft and mixture bubbles. Smash the peaches. In a small bowl, mix some hot mixture in with a thickener (cornstarch or tapioca) and add it back to pot a bit at time until you get a nice consistency (I like my fresh (or frozen) peaches to stay firm, so I add the majority later to be cooked in the pie). Let the cooked filling cool while you roll out your pie crust. 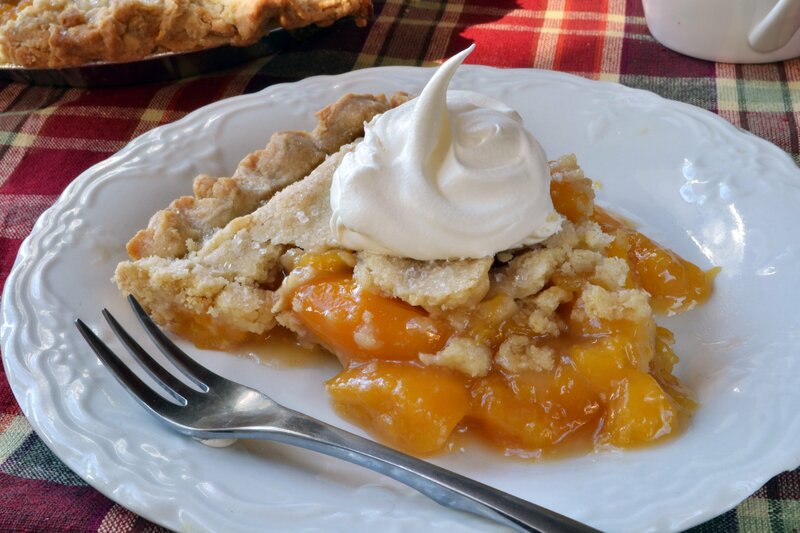 When cooled, add the balance of the sliced peaches (in the summer, I omit the brown sugar and add a ¼ cup of orange juice to make a nice "bright" pie). Beat an egg yolk and brush over crust. Wrap 2 inch foil strips around pie edges to prevent over-browning. Place in a preheated 400ºF oven for 10 minutes, then turn oven to 375ºF and cook 30 minutes. Remove the foil and cook 10-15 minutes, watching closely as edges brown.